The tablet wars are about to heat up. The iPad is currently the only meaningful tablet device around, but that may change as soon as November when Google is rumored to release their Chrome OS Tablet. According to MacRumors, the Google Tablet may be released as soon as November 26 in order to fit into the holiday shopping season. Google will likely aggressively price the Chrome Tablet against the iPad, although the pricing structures for the device and accompanying data services are currently unknown. Data plan contracts are expected to subsidize the consumers cost of the tablet dramatically, similar to the manner of cell phone contracts. Apple’s iPad is the dominant tablet computer at the moment, and thus far all other attempts at competing in the marketplace have flopped. Microsoft has already floundered, leaving Google to be the only foreseeable threat to the iPads dominance. Google hopes to replicate Androids success against the iPhone with their entry into the tablet market, creating yet another head-to-head battle between Apple and Google. 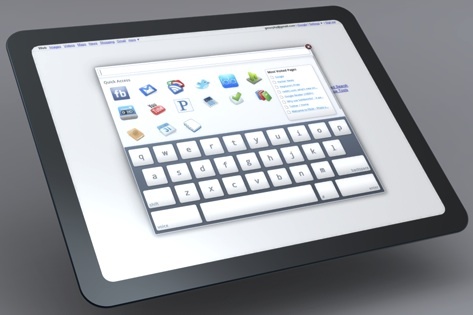 Not much is known about the touch interface of Chrome OS, or the appearance of the Google Tablet itself, the above image is nothing but a speculative mockup. You can run Chrome OS in Mac OS X, but the current version floating around really isn’t that exciting, it’s basically the Chrome browser running in a virtual machine. It’s highly unlikely the released version of the tablets Chrome OS will be as boring. Chrome OS is a bit of a misnomer, the Google Tablet will just end up being a large version of Android OS, which is usable but boring and unattractive. Google should take some UI cues from Apple, the iPhone and iPad are so much easier to use and just look better. Let’s face it, this is a market concerned with appearances, they need to make it prettier and not just cheaper to compete well. I don’t have any doubts it will sell though, not everyone can afford a $700 iPad considering they’re really just couch surfing aids.